The CARLTON series offers this transitional vanity piece. This 2 light oil rubbed bronze vanity matched with white opal glass is perfect for your bathroom. Please call 1-800-265-1833 or e-mail dyang@canarm.ca with any product questions. This outdoor flush mount will update the exterior of your home with its eye-catching design. Featuring an oil rubbed bronze finish and clear seedy shade(s), this fixture will accommodate a variety of outdoor of dicor styles. With its easy installation and low upkeep requirements, this outdoor flush mount will not disappoint. Add light and accent to your room with this Hampton Bay transitional style semi-flush mount ceiling fixture. Perfect for eat in kitchens, dining rooms, basements, bedrooms or foyer applications. This fixture compliments many home styles and decors. Installation is easy and will add a timeless look at a great value for years to come. Modern lines, ultra-sleek look and high quality elegant finishes. The Hampton Bay, 1-Light Integrated LED Vanity Fixture features frosted white glass shades , seated on a brushed nickel frame. This LED vanity adds a clean, refined look to your space. Great for vanity and powder rooms. Will add a timeless look at an exceptional value for years to come. The cornerstone of the satin Collection is quality, and this bath bar is no exception. Combining a classic silver finish and posh styling, you will find no better way to highlight the charm of your home. With the superb craftsmanship and affordable price this fixture is sure to tastefully indulge your extravagant side. Carlton 2-Light Vanity Light Fixture in Oil Rubbed Bronze with White Opal Glass The CARLTON series offers this transitional vanity piece. This 2 light oil rubbed bronze vanity matched with white opal glass is perfect for your bathroom. 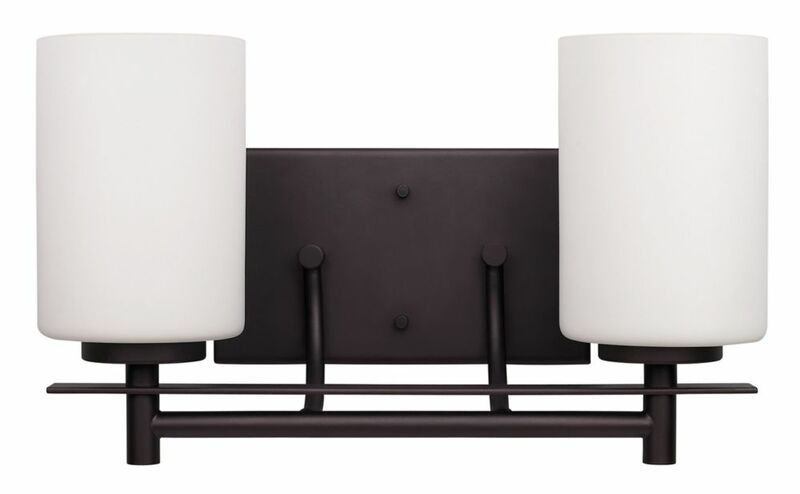 Carlton 2-Light Vanity Light Fixture in Oil Rubbed Bronze with White Opal Glass is rated 4.8 out of 5 by 6. Rated 5 out of 5 by Warrenb from Best looking vanity light for the price Most of the other vanity lights I looked at were more expensive or not as nice. My bathroom had very little space but this was the perfect addition. Rated 5 out of 5 by Medeiros from Great light for the price! Bought this light for my powder room and it’s a wonderful visual accent to my bathroom and provides a good light. It’s great for the price. Rated 5 out of 5 by Hurryhard from As advertised Great value. Similar products cost 50% more everywhere I checked. Solid good looking piece is perfect for my small powder room. Metal and glass..not plastic and plastic. Rated 5 out of 5 by BobM from This light has good quality of materials and construction. Actually fairly heavy for size. No iss... This light has good quality of materials and construction. Actually fairly heavy for size. No issues with installation and has included mount bracket and screws, and wire nuts. Very attractive design. I would only say be sure you check the dimensions for your application, as it is fairly compact in size. Not for bath use only -- I'm using three of these 2-light models in the down position like sconces on a living room wall. Rated 4 out of 5 by Mikey from Styleish little light Just installed this fixture over the vanity. Needed a small, compact fixture for this application. It fit perfectly and it adds a classic look to the decor. The reason for rating it a “4” is because of the difficulty I had assembling the glass shade with the lock nut to the socket. You need very small hands to get inside the shade, line up the lock nut and screw this together. Eventually I was able to succeed. Otherwise a great little light at a good price point.